To browse through the particular section you would like, click on a section name - such as Wet Rooms, Pump Solutions or maybe watch a Whirlpool Bath Video from the Video section,our website has got a wide selection to suit your needs! 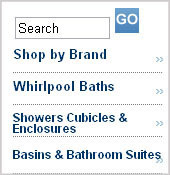 For example, if you wanted to view our unique choices of Whirlpool Baths, press the section named Whirlpool Baths and you will be taken to another page with various other sub-section titles. 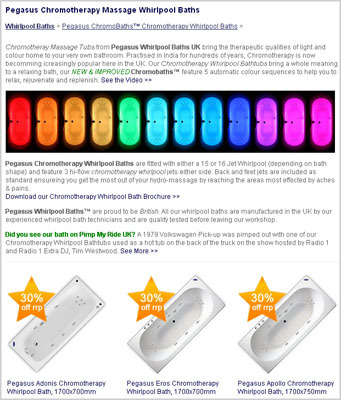 Maybe you would like to see our collection of Chromotherapy Whirlpool Baths, so you would click on the image or title of "Pegasus ChromoBaths"
This is a small snapshot from the following ChromoBaths Page; the area labelled number 1 - is the "breadcrumbs" - its a link to the previous page you have navigated from. 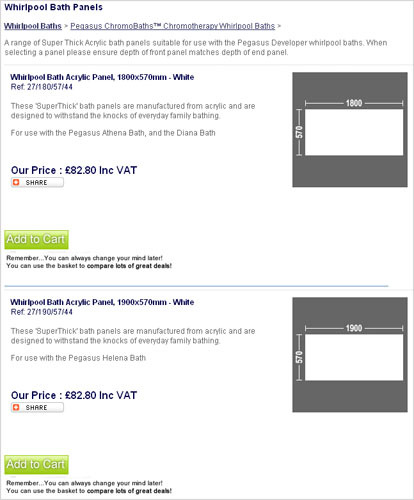 It correctly states "Whirlpool Baths" - as this is the previous section we looked in. The middle section of the page contains information about the section. It may list the type of products, images of particular products or useful information.